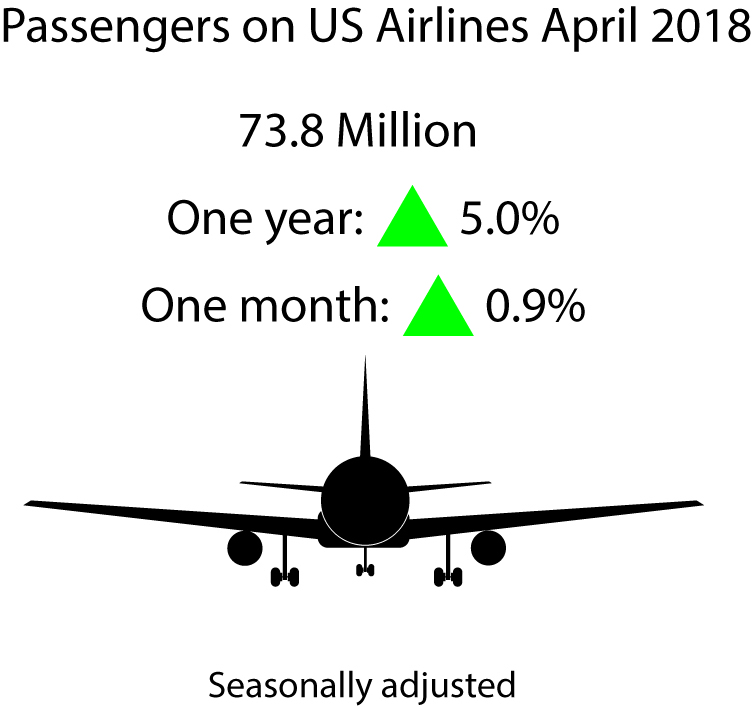 U.S. airlines carried a new seasonally-adjusted high of 73.8 million systemwide (domestic and international) scheduled service passengers in April 2018, up 0.9 percent from March for the third consecutive monthly increase. One Month: March 2018 to April 2018 domestic enplanements rose 1.1 percent while enplanements on U.S. airlines’ international flights to and from the U.S. fell 0.7 percent for a 0.9 percent systemwide increase. One Year: April 2017 to April 2018 domestic enplanements rose 5.7 percent while enplanements on U.S. airlines’ international flights to and from the U.S. rose 0.1 percent for a 5.0 systemwide percent increase. Three Years: April 2015 to April 2018 domestic enplanements rose 12.8 percent while enplanements on U.S. airlines’ international flights to and from the U.S. rose 9.6 percent for a 12.4 percent systemwide increase. Passenger enplanements: Systemwide and domestic passenger enplanements reached new seasonally-adjusted all-time highs. Revenue passenger-miles: Systemwide and domestic revenue passenger miles (RPMs) reached new seasonally-adjusted all-time highs. Available seat-miles: Systemwide and domestic available seat-miles (ASMs) reached new seasonally-adjusted all-time highs. Systemwide load factor (83.8 percent) was down 1.0 points from the all-time seasonally-adjusted high (84.8 percent) reached in October 2015. Domestic and international load factor both declined. The load factor declined from March (84.2 percent) to April (83.8 percent) because system capacity grew faster (0.8 percent increase in ASMs) than passenger travel (0.3 percent increase in RPMs). Seasonally-adjusted trends are for the time period January 2000 to present. Additional data, including domestic and international numbers, can be found on the seasonally-adjusted data page. Passenger enplanements: Systemwide and domestic passenger enplanements reached new highs for the month of April. One month: March 2018 to April 2018: domestic enplanements fell 3.1 percent and enplanements on U.S. airlines’ international flights to and from the U.S. fell 6.1 percent for a 3.5 percent systemwide decline. One year: April 2017 to April 2018, domestic enplanements rose 5.6 percent while international enplanements fell 1.1 percent for a 4.8 systemwide increase. Three years: April 2015 to April 2018, domestic enplanements rose 11.9 percent while international enplanements rose 10.2 percent for an 11.7 percent systemwide increase. Revenue passenger-miles: Systemwide and domestic revenue passenger miles (RPMs) reached new highs for the month of April. Available seat-miles: Systemwide and domestic available seat-miles (ASMs) reached new highs for the month of April. Systemwide load factor (82.9) was down 0.9 points from the all-time April high (83.9) reached in 2017 based on unrounded numbers. Domestic load factor (84.3) was down 0.9 points from the all-time April high (85.2) reached in 2017. International load factor (79.5) was down 1.3 points from the all-time April high (80.8) reached in 2017. The load factor fell from April 2017 (83.9 percent) to April 2018 (82.9 percent) because system capacity grew faster (5.0 percent increase in ASMs) than passenger travel (3.8 percent increase in RPMs). Unadjusted trends are for the time period January 1996 to present. Data are available at Customize Table and can be downloaded from the seasonally-adjusted data page. When the primary purpose is to examine monthly shifts in transportation services output and analyze short-term trends, the variation introduced by normal seasonal changes must be removed from the data. Transportation is highly seasonal, and without adjustment, the data do not give an accurate picture of underlying changes in aviation, passenger travel. Data are compiled from monthly reports filed with BTS by commercial U.S. air carriers detailing operations, passenger traffic and freight traffic. This release includes data received by BTS from 77 U.S. carriers as of July 3 for U.S. carrier scheduled civilian operations. BTS has scheduled Aug. 16 for the release of May traffic data. None of the data are from samples so measures of statistical significance do not apply.